Identical twins are formed when a fertilized egg in the womb splits in two, meaning that the twins have exactly the same genetic code. Being an identical twin is in itself remarkable, but to then go on and achieve fame for amazing athletic prowess, astounding brain-power, business savvy, or simply by being the meanest twins in town elevates some identical twins to a whole new level. 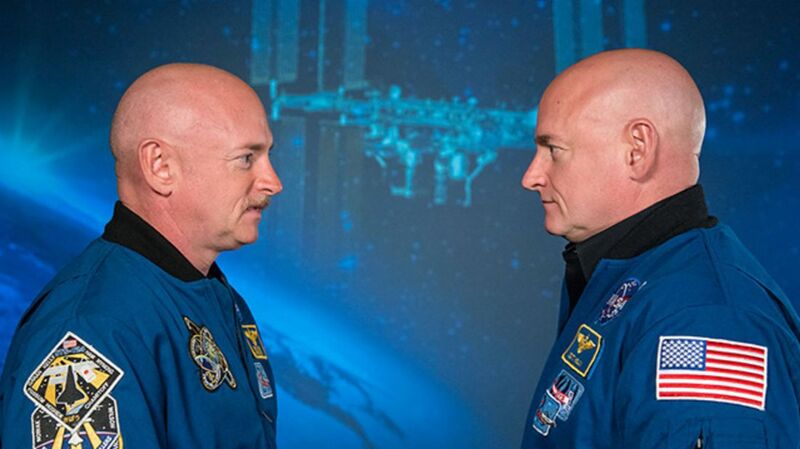 In March 2015 astronaut Scott Kelly (pictured above with his twin) blasted into space to spend a year at the International Space Station—the longest time an American has spent in space. During the mission, his identical twin brother Mark, a retired astronaut, remained on Earth as part of a twin study to act as a control. The idea of the experiment is to study how a long period of time in space affects humans, with the idea that results will be useful in preparation for a potential future mission to Mars. Because identical twins are genetically the same, the effects of a prolonged period in space can be studied by comparing Scott’s mental and physical condition with that of his sibling back on Earth. Scott returned from space in March 2016 and has already begun to reveal the physical effects of his marathon space mission, indicating that adjusting back to life on Earth has been no mean feat. Chang and Eng Bunker were conjoined twins born in Thailand (then known as Siam) in 1811, and it is from them that we get the term “Siamese twins.” Joined at the middle, these remarkable twins did not let their disability hold them back. In the 1820s they met an English trader named Robert Hunter, who asked them to join him for a tour of Europe and America, for which he paid their mother $500 for a 30-month trip. They were an immediate sensation and people flocked to see the brothers perform gymnastics and feats of strength. Chang and Eng spent many years touring the world, exhibiting their amazing bodies and cannily setting aside money so that they were able to retire in 1839 and purchase a plantation. Soon after they got married to a pair of sisters, Sarah Ann and Adelaide Yates, and between them had 21 children. In 1874, Chang died from pneumonia and Eng, seemingly unable to live without his brother and refusing an emergency operation to separate him from his dead twin, died just a few hours later. The story of Jack Yufe and Oskar Stohr has fascinated psychologists studying the effect of genetics and environment on character traits. This is because these identical twins were separated at just six months old, Jack raised as a Jew in Trinidad and Oskar moving to Germany with his mother, where he grew up under the Nazi regime and became a member of the Hitler Youth. When the brothers were first reunited in Germany at 21 years old they did not get along, later citing the fact that they were so similar, so they did not meet up again until 25 years later, when they were persuaded to take part in the Minnesota Twin Study. When they showed up for the study they realized they had dressed in exactly the same fashion and soon found many other bizarre similarities—such as the fact that they both sneezed loudly in elevators and flushed toilets both before and after using them. The twins took part in the twin study over many years and their lives were written about in a number of books, adding a great deal to our understanding of the power of genetics on our character. British identical twins Chris and Xand van Tulleken are both doctors who have made a number of documentaries using themselves as human guinea pigs in the name of science. The brothers made a documentary about binge drinking, where one brother drank a supposedly “safe” amount of alcohol (3 units) every night for a month, while the other had to binge all 21 units in one session once a week for a month. The experiment showed that drinking every day was almost as bad for your liver as binge drinking. The intrepid twins then made a documentary where one twin ate almost no carbohydrates and the other almost no fat for a month. They concluded that both fad diets were harmful but that the low-carb diet was especially so: despite losing a lot of weight, the twin on this diet saw his health suffer, was slower both mentally and physically than his brother on the low-fat diet, and was at risk of developing diabetes. Identical twins Mike and Bob Bryan are the most successful tennis doubles duo of all time, having won Olympic gold medals, all four Grand Slams numerous times and holding a 23-4 Davis Cup record. One of the secrets of their success is that they are “mirror twins,” meaning Mike is right-handed and Bob is left-handed, giving them extra court coverage and a huge advantage. The Bryan brothers won their first tennis tournament when they were just 6 years old (it was an under-tens title). Since then they have played all over the world, racking up titles and performing their famous celebratory chest bump. British identical twins Ross and Norris McWhirter created the Guinness Book of Records in the 1950s. The best-selling book has sold over 100 million copies worldwide and has been translated into 37 different languages. Norris acted as timekeeper in 1954 for his great friend Roger Bannister when he became the first person to break the four-minute mile, and his love of both sports and trivia inspired him and his brother to create their famous record book. Both brothers were actively political and in 1975 Ross was murdered by the IRA after offering a reward for any useful information on the terrorists. Polish identical twins Lech and Jaroslaw Kaczynski found fame at a young age, appearing in the 1962 Polish film Those Two Who Would Steal the Moon. But it wasn’t their acting that would establish their lasting reputation. In 2005 Lech was elected President of Poland, and nominated his twin brother as Prime Minister. This achievement crowned years of work in the political world, where the brothers had served as members of parliament and Lech had been mayor of Warsaw. In 2010, while Lech was serving as President of Poland, he and a number of other high-ranking Polish politicians were tragically killed in a plane crash in Russia. Born in 1933, the Kray twins, Ronnie and Reggie, rose from modest beginnings to control large swathes of underworld London with their brutal protection rackets. Petty criminals from a young age, the brothers were kicked out of the army for repeatedly going AWOL, and became two of the last criminals to be imprisoned in the Tower of London. In the 1950s, they set up their East End protection racket, and after moving into the glamorous world of nightclubs in the 1960s they soon rubbed shoulders with stars such as Frank Sinatra and Judy Garland. Behind the glamor, however, was a seedy, violent world, and soon both twins were jailed for brutal murders. The Krays' story caught the public imagination, and numerous books and films have been made about the infamous pair, although in the United States they might be best known as the inspiration behind Monty Python’s Piranha Brothers.